Great space for family (2 adults and 2 teens). Centrally located. Clean with all needed amenities. Washer and dryer were handy. Lovely little Veranda overlooking the pool. We would stay here again when we come back to Perth. The apartment stays at the Main Street of Subiaco which allows easy access to shops, transportation etc. The apartment is part of a nice complex with pool and nice garden. 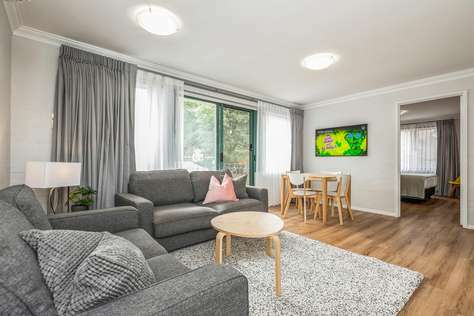 Both key to car park and room are very user friendly and allows easy access to room, in where you can find basically everything you needs for a short trip to lovely Perth. The neighborhood are fairly friendly and quiet which really allow you to enjoy a peaceful stay in the apartment. CBD and various shopping center including outlet center are only few minutes drive, as well as many nice parks. It is indeed a very affordable and comfortable place for anyone who really wants to join their living in Peth short or long. "Great central location, easy to walk to the city, public transport, good bed and everything you need, worked very well for our group of people we had 5 units all in close proximity, the unit had a welcome pack of cereal and tea/coffee and some dishwashing tablets, loo paper and laundry detergent to get you started – this was great"
"Conveniently located, tidy and well equipped." "it's been great, having the small things there cereal, milk, coffee, tea, soap, cling film, foil, salt and pepper, cooking oil etc makes it feel immediately homely. We loved the tranquil balcony to sit on and catch the afternoon sun, secure complex. Great location with easy access to shops and parks in inner west and the city area. Wifi that actually works!" "Thank you for our comfortable stay in Subiaco, we had a wonderful time. " "Very central and much quieter than I thought it would be given property is on Hay Street. Very clean, well equipped and comfortably furnished – much better than a hotel." "So quiet and next to good facilities. Overall just loved it and are coming back soon."